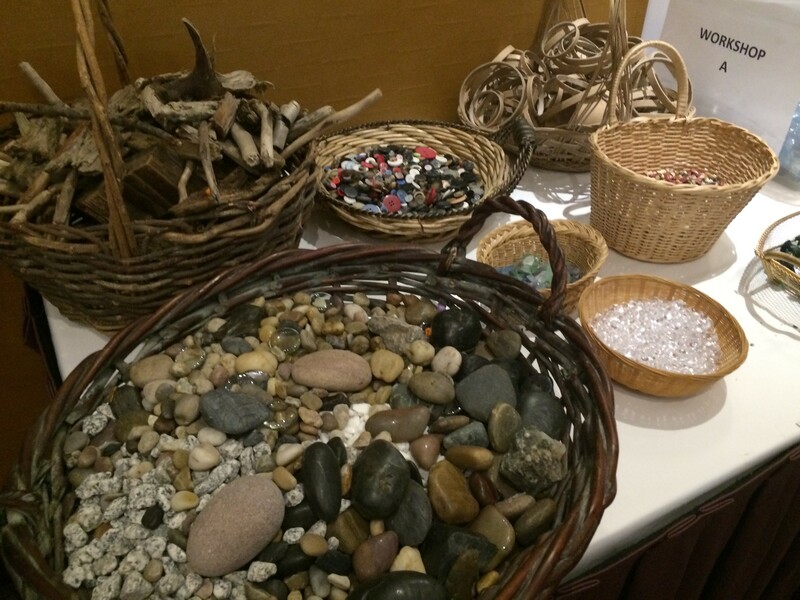 Have you heard of the Theory of Loose Parts? I attended an Early Childhood Education conference (#ECEBC2016) a couple of weeks ago a month ago (where is time going?! ), and enjoyed revisiting this concept of impermanence and open-ended play. I have a lot to share on this conference, but it can’t fit into one post, so I’m breaking it into workshops and presentations. What is following is my takeaway and some thoughts on the Experiencing Loose Parts and Documenting workshop by Diane Kashin. If you’re new to the Theory of Loose Parts, it’s something I have been fascinated with since my ECE training. The basis is that by offering children open-ended “loose parts” to play and engage with (for example, this seed collection or these simple glass beads), we are giving them more opportunities to imagine, create, and play (remember, play is important as children work through concepts this way) in ways that are important to them, rather than with toys that are narrow in what they offer children. I could chatter on this topic so much more, but I’ll keep it simple and let these workshop takeaway bits and pieces do the rest of the talking today. For example, a plastic dump truck from a children’s show is more likely to be used only in that one way, restricting the creativity and concepts that matter to the child in where they’re at with their unique journey. What can children learn, work through, and create when given the chance to explore their own experiences through materials that have so many more ways of being used. My tree seed collection. You can read all about that here. Imaginary play with the seed collection. Z was building a home for her doggy. The little seed shell in front was his food bowl. First of all, like the speaker, I love the term “messing about”. Children make messes, and that’s okay. Life is messy. They are learning through those messes, just like we are learning through our own messy lives. What can be learned when given the space and time to do what they know they need to do to learn what’s important to them? Creating transient art on a playdough base. FYI: This is an affiliate link for very cool non-toxic and edible art materials. We did an activity at this point in the workshop wherein each table (about 6-8 people each) sent one person to gather some of the loose parts available, and another to collect a mat or frame – basically something to define the space we would be creating in. We then took turns going around the table to add different loose materials on the frame to create transient art (impermanent art) without speaking. This activity brought up a lot of realizations for myself and the group. One of the things I noticed was that, at the beginning, we each seemed to be working towards our own visions for the project. As we carried on, I noticed more feeding off and responding to what was placed in the turns before. I felt like this was an activity that could be beneficial to small groups of children, giving them the opportunity to practice turn taking, creativity, and collective projects. My table’s collaborative transient art. The latter portion of this workshop focused on the importance of documenting the experiences of learning. This should come as no surprise to you, being that I enthusiastically document a variety of experiences through my blog and my camera, but documentation has always been another passion of mine. In my previous placements I have put a lot of effort into writing down children’s words and actions during early learning experiences, in an effort to weave these stories into memories that can be revisited again and again by the children, teachers, parents, and community. Making learning visible in this way, leaving traces of the experiences that have happened, is an important part of the process, as it opens up experiences to reflection. Reflection for the children to see how they’ve learned and gain a new perspective on what has happened, to engage the teachers in thinking about how next to proceed with the threads of learning and interests of the children, and to share this learning with the community. By making children’s learning visible, we give importance to what is happening. We help those inside and outside of it to recognize that there is so much more happening when children are “just playing”, and that children are active and incredible thoughtful meaning makers and citizens of our world. Another table’s collaborative transient art. The documentation they created to share their experience. So. Do you think you’ll give this provocation to play a try? Do you have any particular collection of materials in mind? You can easily head into nature and glean some natural treasures to use in loose parts play and transient art. Not only will you find interesting (and free!) materials, but the collecting makes for a fun activity together as well, getting fresh air and exploring. It can be a whole other learning experience just in itself. Maybe you’re already offering loose parts to the little ones you care for. I’d love to know what you like to use, and get some new ideas for collections. Leave me a comment below, and please do connect with me on social so we can get to know each other better. You can find me on Facebook, Twitter, Instagram, Pinterest, and even YouTube. Did you like what you found here today? I invite you to join my community of readers who have signed up to receive a quick weekly update about what’s new on the blog, so you don’t miss out on anything that interests you. You can sign up here. Whatever you do, I hope you enjoy your time with your littles! Have a FABULOUS day! Disclosure: This post contains an affiliate link for an edible and non-toxic art supply store. For my full disclosure policy, click here. I have also been exploring loose parts with my students. Yes! I need to cut up some fabrics I’ve been saving for this purpose. And the gems are always a hit. 😉 Thanks for the comment.